Experience some of the very best saltwater and freshwater BC fishing while staying at Island Tides BC Fishing Lodge located in the historic West Coast Vancouver Island Village of Zeballos on North central Vancouver Island. 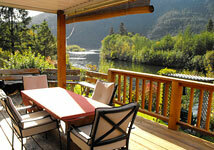 Our BC fishing lodge is situated on the banks of the Zeballos River where the river meets Zeballos Inlet. 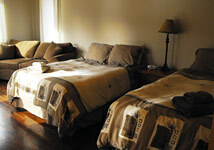 Our fishing charter guests are offered first class accommodation with all of the comforts and amenities of home. With spectacular views of the river to sea and the surrounding mountains, our unique BC fishing lodge is the perfect place to relax and experience the magnificent West Coast scenery after a great day of BC fishing or sightseeing. The lodge is located only minutes, by walking, from boat and floatplane docks, local stores, pub, local museum and three different nature walks ranging from 20 minutes to several hours. At Island Tides Vancouver Island Fishing Lodge we start the day off with a continental breakfast of fresh breads, bagels, muffins, cereals, fruit and fruit juices, preserves and condiments, coffee and tea. Hot breakfast is available. Lunches are generally packed for the boats or shore lunch and consist of tasty sandwiches, cookies or cake, fruit snacks, and hot or cold beverages of your choice. Dinners are served in our lodge dining room where our guests can relax and enjoy a glass of wine with their evening meal. We serve fresh seafood (catch of the day), tender prime rib, tantalizing pasta dishes, fresh salads, breads and mouth-watering desserts. 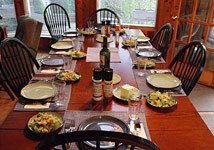 Our fishing lodge caters to groups of 2 to 9 people with overflow capacity for up to 10 people. This makes Island Tides BC Fishing Lodge the perfect Vancouver Island getaway for individual travelers as well as smaller family and corporate groups. We can arrange transportation to and from either the Campbell River or Comox Airports, making your Vancouver Island fishing vacation hassle free. At Island Tides BC Fishing Lodge on West Coast Vancouver Island we specialize in BC freshwater and saltwater fishing adventures; but there are a variety of other island activities available in the area for non-anglers. These include: guided marine and wildlife tours, guided sea kayaking excursions, scuba diving, and hiking, beachcombing on the outer beaches or just relaxing and enjoying some "island time". The fall months of September and October are great times to be in Zeballos on Vancouver Island, BC for viewing the bald eagles and black bears fishing for migrating salmon in the Zeballos River directly across from our fishing lodge. 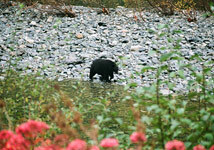 Wildlife viewing does not get any better than this. 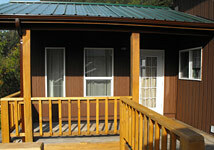 It's all here waiting for you at our fishing lodge on Vancouver Island, BC!